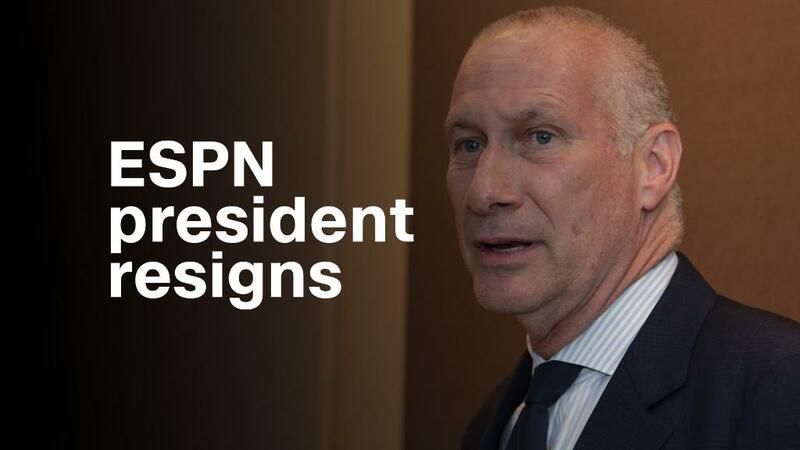 ESPN president John Skipper was hiding a substance abuse problem for many years. On Monday, he stopped hiding. Skipper's resignation, which took effect immediately, stunned the sports and media worlds. ESPN hosts and staffers wished him well and privately wondered who will take over the TV sports empire. Disney CEO Bob Iger has given himself 90 days to figure that out. Tuesday is the beginning of the post-Skipper era at ESPN. Last week Skipper hosted "Talent Gathering 2017" for nearly 500 staffers. All of ESPN's famous faces, voices and bylines were there for an end-of-the-year meeting about the state of the business. There was no hint that anything was amiss. So what was the triggering event for Skipper's abrupt exit -- indeed, was there one single event? That's unknown. "The most important thing I can do right now is to take care of my problem," Skipper said in a message to staffers. He has asked for privacy, but followup stories are inevitable. So far, there's been no indication that his resignation is linked to any other sort of scandal or business machination. Earlier this year, Disney re-upped Skipper's contract through 2021. The contract renewal news leaked one month ago. That's what made Monday's news even more shocking. Skipper apparently managed to keep his addiction a secret from even his closest confidants. "The number who knew before Friday night? Zero. With 99.9% not knowing until this morning," ESPN biographer James Andrew Miller tweeted on Monday. When I asked a well-placed source why the resignation happened now, the source said "addiction doesn't follow neat and orderly lines." The source added: "He made a choice. He chose his life." This individual also said last week's Disney-Fox deal had nothing to do with Skipper's announcement. "You cannot overstate the shock this will be to the ESPN ecosystem," Sports Illustrated media reporter Richard Deitsch wrote. Skipper took over ESPN in 2012. His predecessor George Bodenheimer, who served as president of the network from 1998 to 2011, is now back in charge as the acting chair. Bodenheimer is at ESPN's headquarters in Bristol, Connecticut, as of Tuesday. It's notable that there's a clock running on his time in the job. ESPN says he is in place for the next 90 days to help Iger find a new president. "I've stayed in close contact with John, and I believe in the direction he's taking ESPN," Bodenheimer said in a statement. If anything, that's an understatement -- he sat next to Skipper at the Sports Broadcasting Hall of Fame just last week. "Keep in mind that most executives at ESPN were hired by Bodenheimer," Miller tweeted. "This is the easiest transition possible under circumstances." Who could be the next ESPN president? "Throughout its history, ESPN always has turned inwards to find its next president," Sports Business Journal reporter John Ourand wrote. With the job unexpectedly open now, two likely candidates are ESPN affiliate sales and marketing boss Justin Connolly and content chief Connor Schell. Other names that are circulating include ESPN executives Russell Wolff and Burke Magnus, Disney executives Jimmy Pitaro and Kevin Mayer, and F1's Sean Bratches, who was in contention for the president job back when Skipper was ultimately promoted. A version of this story first appeared in CNN's "Reliable Sources" newsletter. Subscribe here!